Yes, I have moved my Pic of the Day blog to Pic 4 Today. Same content, new look, different server. 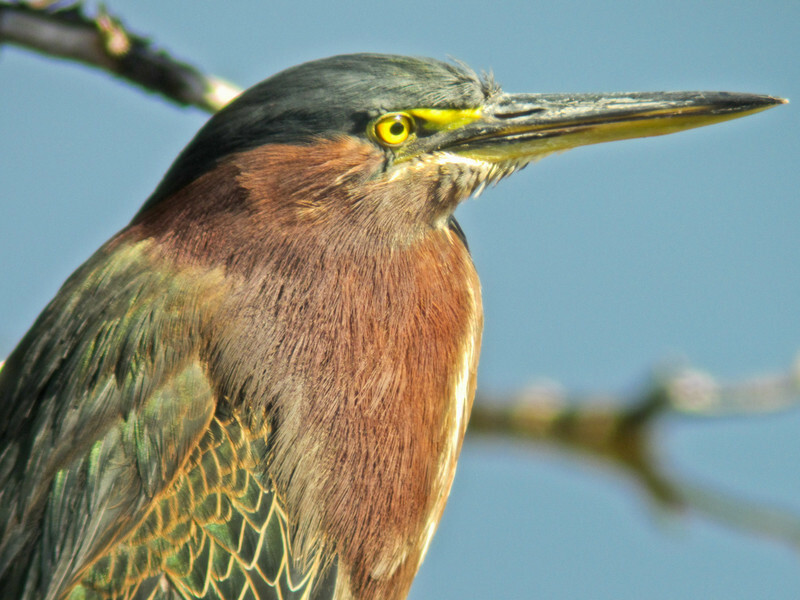 Back to digiscoped birds for Wings on Wednesday! 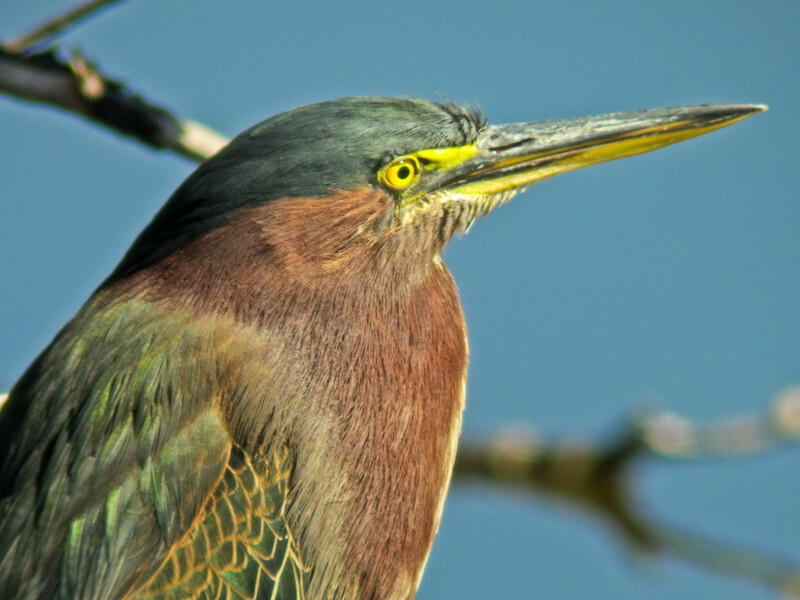 Ever wonder why it was called the Green-backed Heron and is still the Green Heron? I have. Sometimes birds just have to get in the right light. I was digiscoping this bird tucked back in the mouth of the culvert pipe between the Rest Room pond and the water channel at Merritt Island NWR (I have already published one set of pics of this bird from this trip taken on another day…see 2/8) when he moved from the shadows and posed in full sun on a dead mangrove branch. How good is that! 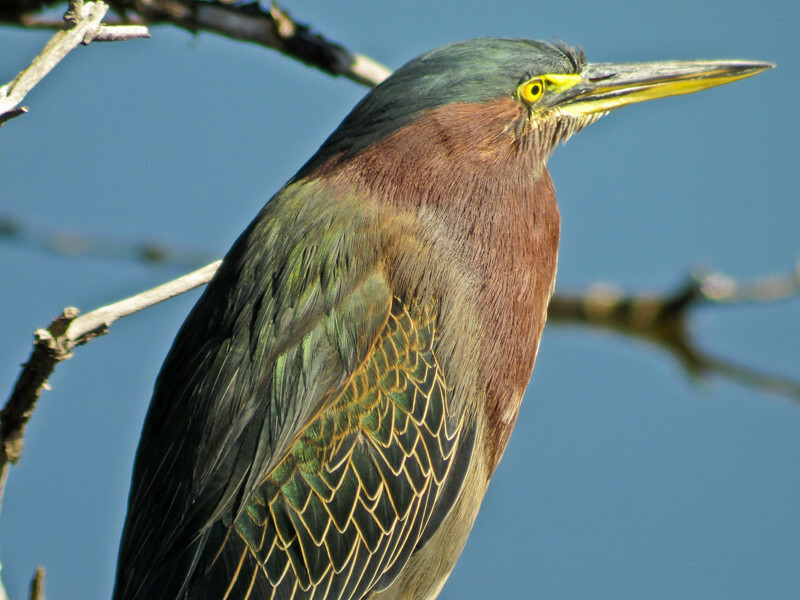 Here you get to see the full range of plumage colors on this stunning bird, including the green iridescence on the wings and back. It was a first for me. Here it is a bit closer. Needless to say, I have a lot of exposures of this bird in this pose! It was just such a stunning view, and that is such an amazing green! 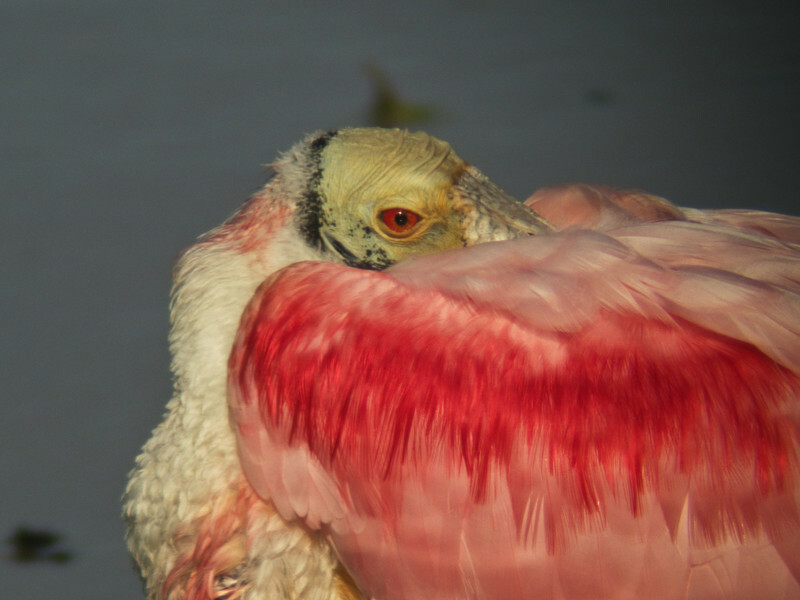 And there is NO light like FLORIDA light for digiscoping! Canon SD4000IS behind the 15-56x Vario eyepiece on the ZEISS DiaScope 65FL for equivalent fields of view of 1) 1000mm @ 1/400th @ ISO 125, 2) 2500mm @ 1/320 @ ISO 125, 3) 3500mm @ 1/200th @ ISO 125 and 4) 3500mm @ 1/320 @ ISO 125. Processed for clarity and sharpness in Lightroom. No color enhancement. That is just as the bird struck the sensor! 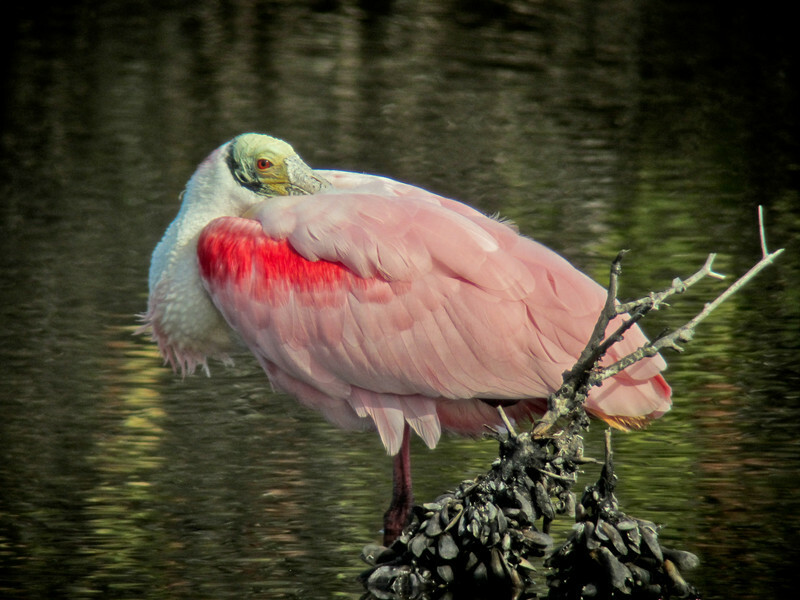 While I am not done with the digiscoped birds from Merritt Island, I, for one, need a break. Yesterday morning we had fresh snow, and as the front passed away out to sea in the afternoon, some spectacular skies. 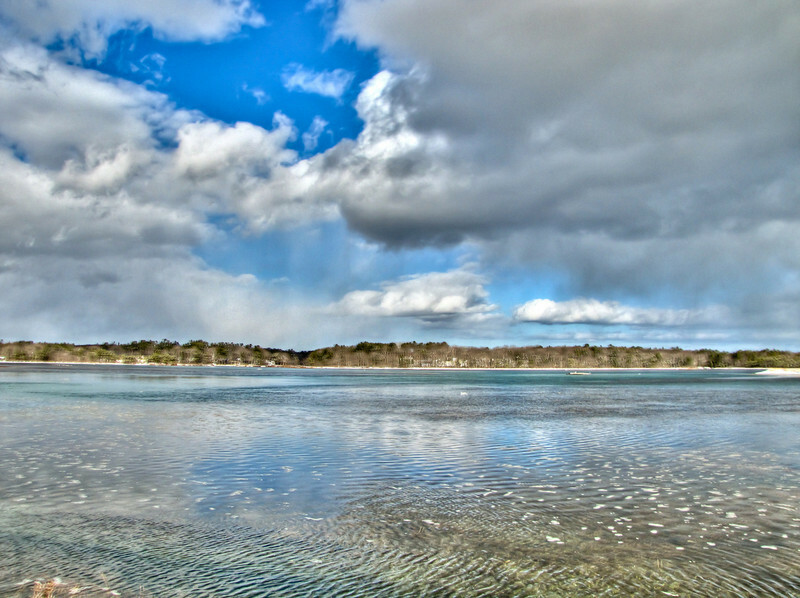 Add as high a flood tide as I have ever seen along the coast here and you have the makings of some HDR landscapes, or sea-scapes, or river-scapes…some-scape with a lot of water and sky. This image walks a fine line, to my eye, between natural and over-the-top. It presents a reality that is there, but that, without the emphasis of HDR and tone-mapping, many people would not see. It is the reality a painter records when painting such a landscape…an image built up in the mind over time, as the details and the colors catch the attention one by one, as the shadows and reflections on the water burn in to the awareness. It is not what you see at a glance or in the moment, and therefore perhaps strikes the eye as not strictly photographic. It is something between a painting and a photograph. I don’t, in fact, know if any such space exists, and, even in my own mind, the jury is still out on HDR and tone-mapping…but I do know that I like this image. I like the drama of it…the vivid world it portrays…the intensity. It is just so alive on an lcd monitor, with the light behind it. I like it. Canon SX20IS at 28mm equivalent field of view. Three exposures centered around –2/3 EV, assembled and tone-mapped in Photomatix, final processing for intensity and clarity in Lightroom. Some distortion control and a bit of noise reduction (generally needed in HDR) as well. Not really, of course, since this is north Florida. A few miles east of Titusville on route 50 there is a major conservation area, practically unmarked, between the road and the river: Canaveral Marshes Conservation Area. I’d never heard of it, but I saw the sign on my way back from an abortive trip to Orlando Wetlands (still closed for hunting, apparently, even in January) and turned around to go back for a look. It was late afternoon, with storms coming on, but I took a nice, if lonely walk back in from the road for a mile or so. There was nothing much doing…just acres of open grassland with tree cover and small patches of swampy forest along what was apparently and old road. 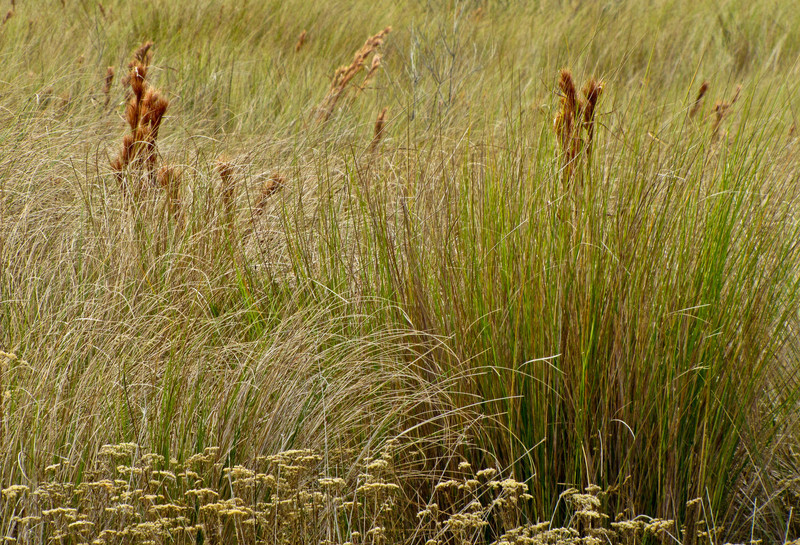 This small stand of mixed grasses along the way struck me as somehow exotic, like something from a savanna or the pampas, hence the title. Of course I have never visited either, so it is no more than a feeling based on who knows what set of impressions from film, tv, magazines and books. Until I went for the title, I didn’t even know I knew what a pampas was. 🙂 And I had to google it to be sure. Argentina? Okay. Of course what really caught my eye was the mixture of textures, curves, and subtle colors, built up around those darker feathery heads. I used a medium long telephoto setting on the SX20IS zoom to frame an interesting pattern, and then cropped in Lightroom to eliminate some distraction at the top. Canon SX20IS at 380mm equivalent field of view, f5 @ 1/400th @ ISO 200. Landscape program. Processed in Lighroom for intensity and clarity. And a happy Presidents’ Day to you! We have completed our meal of Roseate Spoonbills for this winter (I will back in Spoonbill country in April 😉 and we finish with this delicious dessert confection. It was taken a few moments after yesterday’s helping, but turned 180 degrees so that the low afternoon sun was full on the birds, raising the pinks to a whole new level of intensity and giving dimension to the eye. 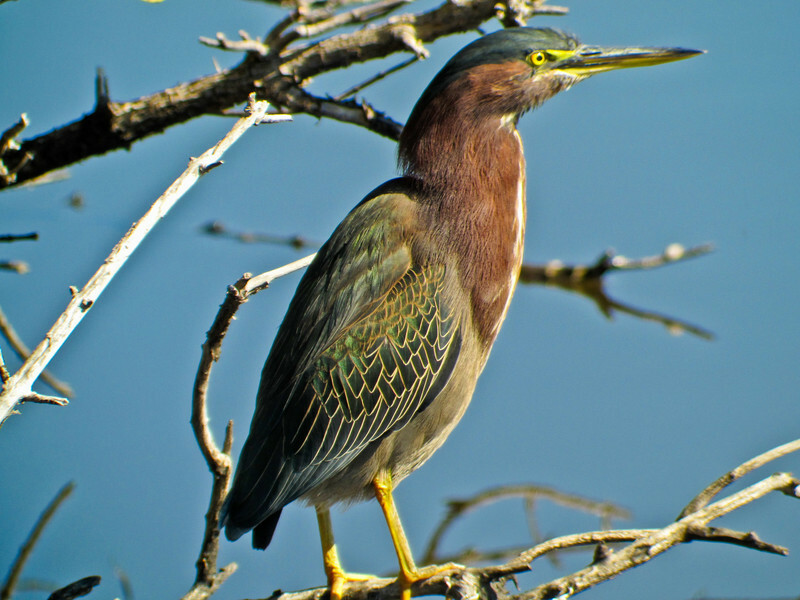 The bird is on that same mussel covered mangrove snag (see 2/18) and may well be the same bird. But what a difference the light makes! Canon SD4000IS behind the 15-56x Vario on the ZEISS DiaScope 65FL for equivalent fields of view of 1) 5000mm @ 1/500th @ ISO 125, f13 effective, and 2) 2000mm @ 1/1250 @ ISO 125, f5.6 effective. Processed in Lightroom for clarity and sharpness. That was a lot of Spoonbills, a 5 course meal. 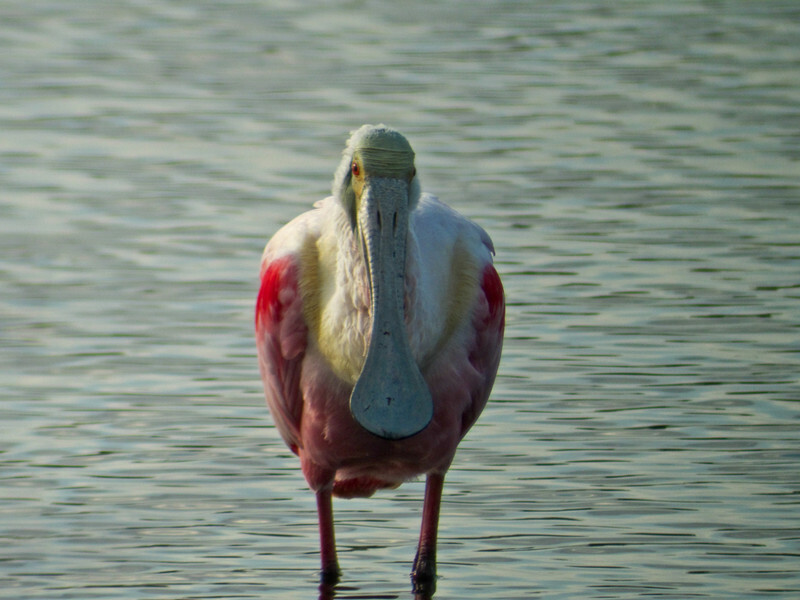 Do you suppose if I lived in Titusville and visited Blackpoint Wildlife Drive at Merritt Island NWR daily, or even weekly, I would get tired of looking at Spoonbills? Do you suppose they might become so ordinary that I would stop looking. I’d like to think not. I’d like to think I could continue to celebrate the amazing beauty of this bird in all its seasons and in every weather and light. I know that is the way it ought to be…that I should be capable of that. I know that it is a matter of paying attention, of seeing through the film of ordinary to the extraordinary at the heart of every moment. I know that every moment is newly created…that every moment the world, the universe, myself, is newly created, had I only the eyes to see and the mind to grasp. If I were only willing to abandon the narrative of my existence which commands so much of my attention…if I were willing, as Jesus said, to die to myself I might live in the moment in all its infinite creative potential. I suspect that is the way we are made to live…that such a life, being the life of our creator, is supposed to be ours as well. 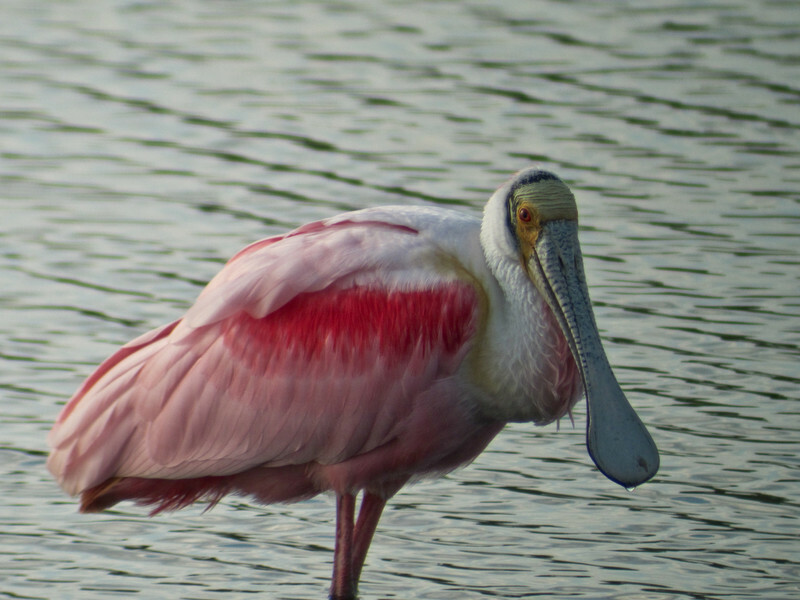 If I ever get tired of looking at Spoonbills, it should come as a wake-up call, as a blaring alarm to bring me back from the sleep and dream of self to the waking life I could be living with my creator. After-all, I fully believe my creator made, and makes, the ultimate sacrifice so that I can turn from self and see…and in seeing, celebrate. Though it is generally beyond our culinary art, a good dessert, the right dessert, should leave you hungry, ready, pallet cleansed, for your next meal! 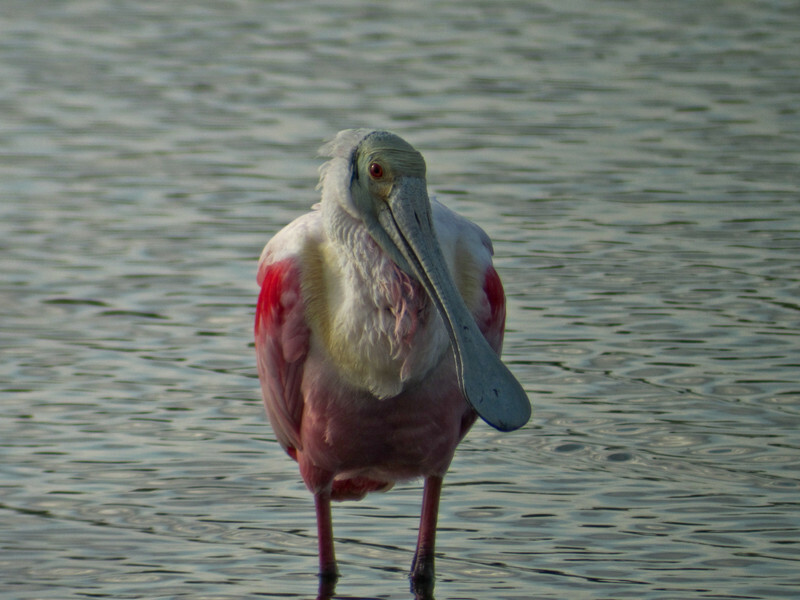 It is all about the spoons today, in this forth helping of Roseate Spoonbills from Merritt Island National Wildlife Refuge…that bill! This is one of those cases where only a picture will do it justice…words fail. These shots from late afternoon with the light behind the birds show some of the subtitle texture on the leather-like upper bill, and the elongated nostrils, both of which I had missed until now (the plumage is so spectacular that it is easy to over look finer details…or at least it is for me). Different angles, but still all about the spoons. Canon SD4000IS behind the 15-56x Vario eyepiece on the ZEISS DiaScope 65FL for equivalent fields of view of 1) 4000mm @ 1/500th @ ISO 125, f11 effective, and 2-3) 2000mm @ 1/640 @ ISO 125, f5.5 effective. Programmed auto. Though this is a case where Exposure Compensation for backlight might have been effective, I am learning that the Canon SD4000IS’s digital sensor has more dynamic range that I am used to, and generally, especially when the bird fills a significant amount of the frame, does better on straight Auto exposure than I can do by fiddling with EV. This is good. One less thing to worry about. Processed in Lighroom for clarity and sharpness. 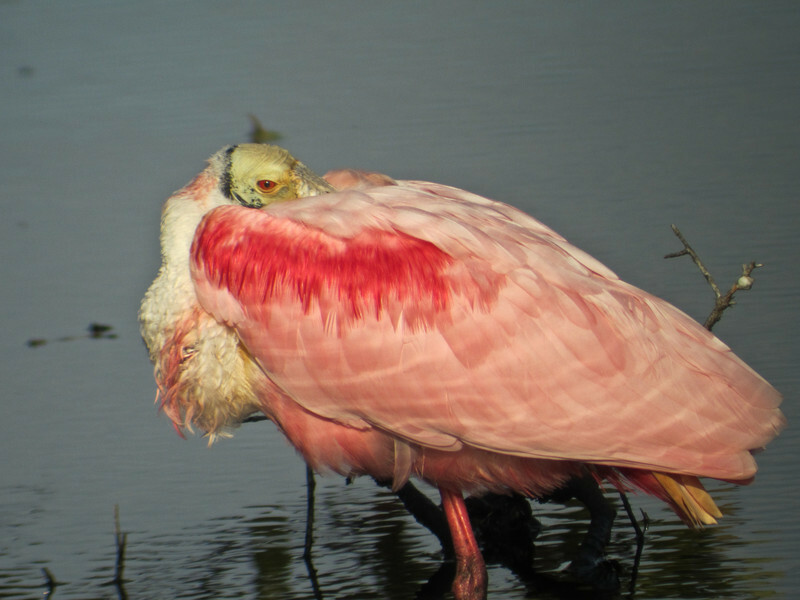 Are you satiated with spoonbills yet? I hope not since I have several more helpings, from my visits to Black Point Drive at Merritt Island National Wildlife Refuge last month. This time I will throw in some mussels for variety, clinging to the roots of a dead mangrove…and reflections in the water. Make a meal of it, so to speak. Canon SD4000IS behind the 15-56x Vario eyepiece on the ZEISS DiaScope 65FL spotting scope for the equivalent field of view of a 3000mm lens @ 1/1000th @ ISO 200, f7.6 effective (scope limited). Processed for clarity and sharpness in Lightroom.